Most of us installed Facebook on our smartphone to connect with our friends and love ones every time we can connect to the internet. 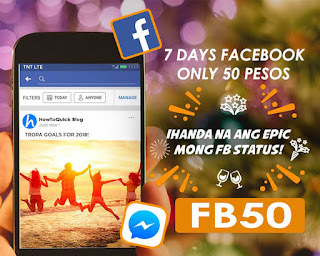 With Talk N Text’s latest data offer called FB50, you can enjoy 7 days straight access to Facebook for only 50 pesos. If your main purpose of subscribing to an internet promo is FB and Messenger, this is the best bundle that you can avail right now. It’s very budget friendly, you only spent around Php7.00 per day to get 500MB data daily for one week. You get a total of 3.5GB of data allocation that you can use to watch videos, post updates, upload photos and other Facebook online activity for your 50 pesos. Using your Talk N Text prepaid SIM, you only need to reload 50 pesos on your account to register with FB50. You can buy load credit at your nearest loading store, retailer, kiosk and online. If you want to subscribe via SMS or text, you can refer to the keyword below. If you want 3 days FB for 10 pesos, check out TNT Facebook 10 with 200/MB per day data allocation. Tip: It’s better to use TNT LTE SIM when you subscribe to this promo to enjoy faster internet browsing speed if your location is already covered by Smart/TNT LTE network. Before you start using this promo, make sure you received the SMS confirmation from TNT that says your promo is already active and ready to use.